Since organic strawberries are free of the dozens of Chemical Fungicides and herbicides most strawberries are treated with, they have a tendency to parish more quickly. 3) when slicing your strawberries for eating, save the top pieces and put them in a glass of water to enjoy strawberry infused water! The key to keeping it fresh is to kill any spores on the fruit. The pH of vinegar does that job. Place the berries in a large bowl and wash them in a vinegar-water bath: 1 cup of white vinegar and 8 cups of water. 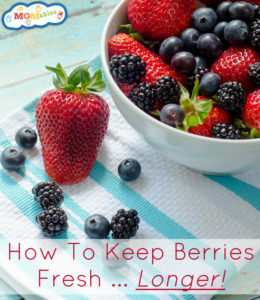 Let the berries sit in the vinegar-water bath, gently moving them to help dislodge any dirt, grime and letting the vinegar kill spores and bacteria. Drain the berries in a colander and then thoroughly rinse the fruit (to remove any vinegar flavor). Store the washed and dried fruit in a sealed container that has been lined with paper towels and has a little air flow. Photo and Berry Wash tip from the wonderful resource momables.com!